Blues and more with Larry Lisk. A full service blues show featuring classic blues to the most recent releases. Mo Blues Monday keeps you current with local and national blues news and information, a full local blues calendar, your requests and of course, the Blues Goody Bag, always filled with CD’s or blues related items to share. evening as we explore the roots and branches of this uniquely American music………the blues. Larry has a long history in the Tampa Bay music scene. As co-founder and former President (1997-2005) of the Suncoast Blues Society, the group was awarded the prestigious Keeping The Blues Alive Award as the Blues Organization of the Year in 2004 from the Blues Foundation in Memphis. 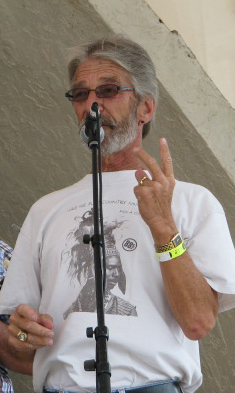 Larry personally received the Keeping Blues Alive award for Public Radio in 2014, and also the Excellence in Blues Radio award from Tampa Bay Blues Foundation 2014. He received the Lifetime Achievement Award from WMNF in 2011 and the Lou Gehrig award for 14 years and 712 consecutive shows. From Larry Lisk: My love affair with WMNF began upon my arrival to the Tampa area in 1980.
marathons was not enough and I began to volunteer at the station. I answered phones at marathons, manned the door at many station events and generally did what I could, when I could, for this great little radio station. During that time I guest hosted a few shows, was checked out on the board and became a substitute programmer. In 1998, a vacancy was created on the afternoon programming schedule and I was asked to "audition" for the job. Harrison Nash and I alternated Tuesday afternoons until January 1999 when I was offered a time slot for the Afternoon Rhythm and Blues Cruise (Harrison became the Wednesday afternoon programmer). The Blues Lover show officially became part of the WMNF schedule and remained a mainstay on the afternoon schedule for 12 years. In 2011 the show was moved to its current spot on the Monday night schedule. I am honored to be able to play the blues for you on the radio and thank you for your continuous support.